In the present day world of Looper, the year 2044, time travel isn’t invented yet. It won’t be a reliable form of travel for 30 years, in 2074, although when it becomes available it is outlawed because of the possibilities of changing the past. Future mobsters use time travel as a black market tool to eliminate evidence of knocking off anyone they want. Just line up someone in the past to accept the transport of the target with a bag over his head (to make it easier on the hitman?) and as soon as they arrive they are shot and hidden somewhere in the past, not to be found again. The guy in the past with the gun–the cleaner–is called a looper. The job pays well for a looper named Joe (played by Joseph Gordon-Levitt) until the mob decides to “close the loop” by sending him his future self (played by Bruce Willis) to be murdered. Looper is directed by Rian Johnson, who also directed Levitt in his Oscar-winning independent teen noir thriller Brick. Johnson weaves his tale together pretty well, yet you might find clues that send you off on red herrings, intended or not. For example, in an early scene a younger Joe’s mother is lovingly massaging his head. In a later scene another woman is doing this exactly the same way. How much meaning are we to read into that scene? Putting aside some nitpicking, the cast is great. 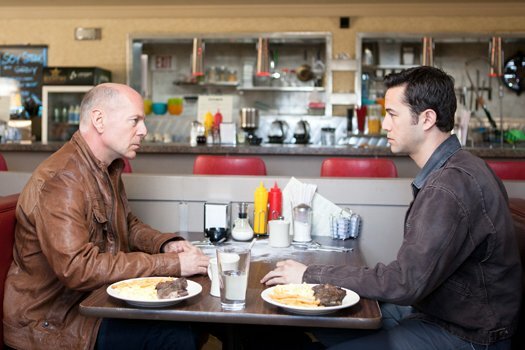 Looper has one of Bruce Willis’s best recent performances and Joseph Gordon-Levitt seems only to get better in each film he takes on. The jury is out on whether the use of a prosthetic nose was a good move for Gordon-Levitt to look more like Willis. It definitely seemed to make the young Joe look tougher and somehow even less attached to society. Emily Blunt, who we loved in The Adjustment Bureau and The Muppets, convincingly plays a tough, kickass mom protecting her son in a very Sarah Connor/Terminatrix performance. And the boy that plays Cid, the young Pierce Gagnon, takes on a role similar to Billy Mumy in The Twilight Zone episode “It’s a Good Life,” scarily full of focused emotion for such a little kid. With the right coaching and agent this kid could go far. Also look for some great special effects including some impressive future cityscapes, nifty futuristic flying motorcycles and slick-looking future cars. 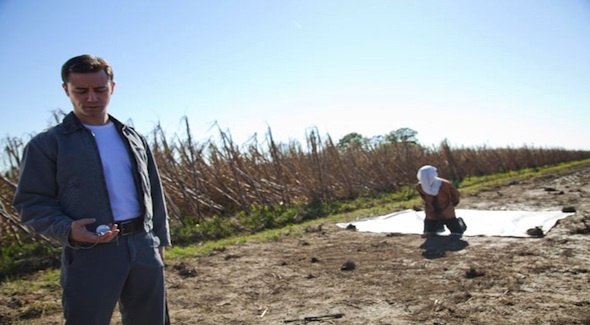 Looper is a great looking movie, filmed by Rian Johnson with a unique and cool style. And unlike many other sci-fi thrillers, this one has a substantial rural setting, something you don’t see very often in sci-fi outside of zombie flicks. Although it won’t be the cult classic that Donnie Darko is, look for Looper to handle similar themes as that incredible film as well as other genre movies like Butterfly Effect and Bruce Willis’s Twelve Monkeys and even the classic crime thriller D.O.A. 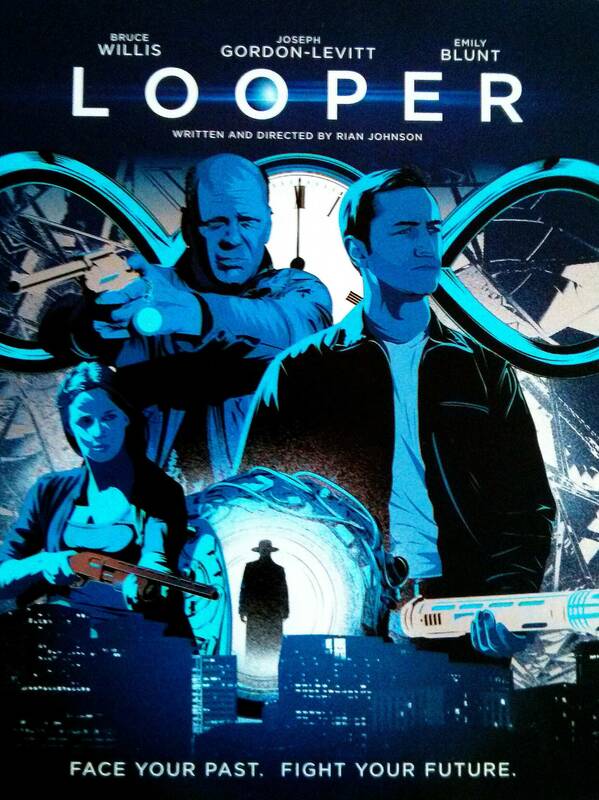 Looper is definitely a video worth adding to your rental queue or get a copy from Amazon.com here.